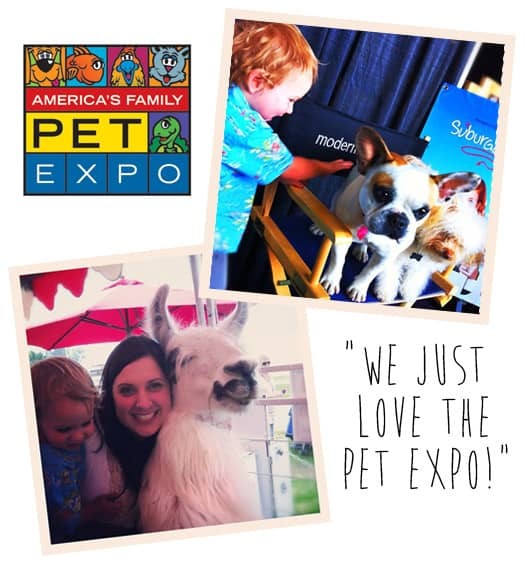 we just love the America’s Family Pet Expo. i took the little one last year and we had a ball just him and i. we met movie star animals, went into the petting zoo, watched awesome bird shows and saw doggies all over the place. it was good times. well the Pet Expo is back! be sure to take the kiddies to experience more than 1,000 animals on display – from fish, rabbits, cats, dogs, miniature horses to exotic lizards – show guests can get up close to all creatures great and small in a variety of interactive exhibits, educational shows and displays, as well as shop the latest in pet trends and products. • Pet celebrities _ meet Mick who plays “Stan” on Dog With A Blog; Beatrice who plays “Stella” on Modern Family; Lambchop who plays “Yakult” on Suburgatory; Milo who plays “Baby” on How to Live with Your Parents; and Frosty who plays “Larry” on Modern Family. • Splash Dogs – Dock jumping dogs….watch these canines jump into the pool! • The Amazing Dobermans – jump, trick and flip with a variety of dogs. • Free flight bird show – watch as these magnificent birds spread their wings and fly! Friday 10:00 a.m. – 6:00 p.m. | Saturday 10:00 a.m. -7:00 p.m. | Sunday 10:00 a.m. – 6:00 p.m.
88 Fair Drive, Costa Mesa 92626.
active and retired military free with ID • parking is $5. here is your chance to win a family 4-pack of ticket to the America’s Family Pet Expo. enter via Rafflecopter AND leave comment in the comment field below. contest ends April 15th at midnight. My little animal lover would love any animal he can get his hands on.